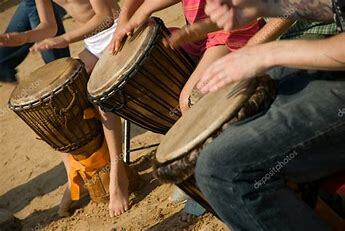 Join us for a fun and lively afternoon of community drumming. Enjoy the sacred rhythms created as we join together to create a joyful sound. No experience necessary. Bring your own drum or borrow one of ours. Everyone welcome. Come and play on the last Saturday of every month. The fact is: everyone knows how to drum. It’s in our DNA and is one of the oldest means of communication, meditation and musical expression. So I just tell them to have courage, keep a steady beat and follow the leader. Nothing could be simpler. - Reduction in the hormonal stress response. distressed and had higher self esteem. - Increase in natural killer cell activity and enhanced immune system. - Alzheimer’s patients who drum can connect better with loved ones. Research shows that the brain forms new neurological pathways when performing arts and music. - Rhythmic cues can help retrain the brain after stroke. - Improves concentration, reduces stress, alleviates pain and boosts the immune system. - Some hospitals take percussion instruments into patients’ rooms and invite them to play as a way of relieving pain and stress, and helping them engage socially. “Handheld frame drums are the oldest known musical instruments. . . In prehistoric times, their rhythms helped shamans and seers attain the sacred trance state necessary for healing and prophecy. The rituals of the earliest known religions evolved around the beat of frame drums.” Layne Redmond in the Introduction to When the Drummers Were Women: A Spiritual History of Rhythm. “When we use a drum, we’re aware of the spirit inside. Symbolically, everything that gives life in the universe is represented inside the drum. The wood was once a treewhich had life-giving substance flowing beneath its bark, just like blood going up and down our bodies. “And the skin covering the drum was once life — it surrounded a body and there was life flowing beneath it. Both the skin and the wood were related to life that’s gone on, yet they are helping the lives that are still here. “What this drum represents to us is a heartbeat. As we dance to the tempo of the drum, we are dancing in harmony with the heartbeat of our Creator, which is life. And as people dance together, we are all in harmony with our fellow man. “This drum beat is a pulse, rather than a tempo — it’s a life pulse. If anyone is feeling great pain from a heart condition and you have nothing on hand to give that person, just beat a drum steadily while you are waiting for help. “The spirit of the One who gave us life, the Life Form of all life forms, is being called, and in time, that person’s heart beat is going to catch up with the drum beat. “You don’t have to be a great medicine person to do this. You just have to have a lot of love in your heart to be able to do it, a lot of concern for your fellow man. That’s why the drum is a sacred instrument to us.” Bear Heart in TheWind is My Mother. 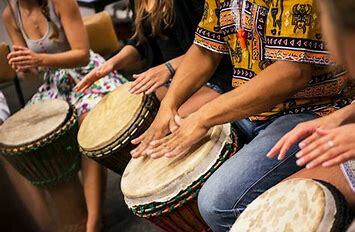 In our drumming circles, there is usually silence in between drumming rounds, because the peaceful energy created by the drumming, along with the unity of the circle, is a beautiful meditation. The sound of stillness is the sound of the Divine. If you ever have the opportunity to drum [be it by yourself, or in a group], go for it. Your ancestors did it, and it’s in your DNA. So it’s easy!